Learning to trust the inner voice, (or Inner Voice) is natural to some people, but a learned skill for most. In the beginning the Voice can seem like just another thought amidst the LA Freeway Traffic Jam of the Mind. Yet something about it catches our attention: perhaps the thought is novel in some way, or there is a body sensation that accompanies it, or it’s a thought that just keeps coming around for another turn, asking for attention. Learning the difference between the voice of guidance (“call that person!”) and the voice of the ego-mind (“go ahead, eat the chocolate cake!”) is a skill worth mastering. And, it’s a lesson that’s never over, Spirit keeps upping the ante. Life teaches us about intuition, and for some it’s a slow learning process. “I had a feeling I shouldn’t have gone out tonight…” “I knew I should have called her…” My healer friend Robbins Hopkins has an expression: “You get as many chances as you need.” It’s her gentle take on the reality that life will keep repeating the circumstances—both the tough lessons and the golden opportunities— till you step up and match the lesson being offered. For some people, guidance comes in very strongly, in a clearly discernible way. Over decades, I’ve become one of those people. It wasn’t always as clear as it is now. Still, there are moments when I question, because it can be a thin line between your lower mind and your higher Self at times. Negotiating that line is one of the main lessons in life. But years of experience have taught me to trust and listen, and so I did. Upon arriving in CA, I found that my co-leader, Rev. 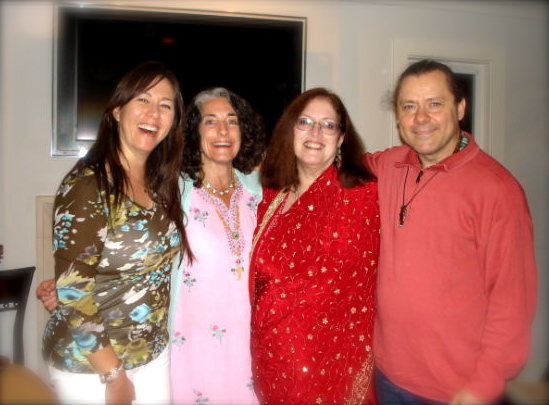 Susi Roos, had also brought along her Indian garb, so we knew something was afoot. 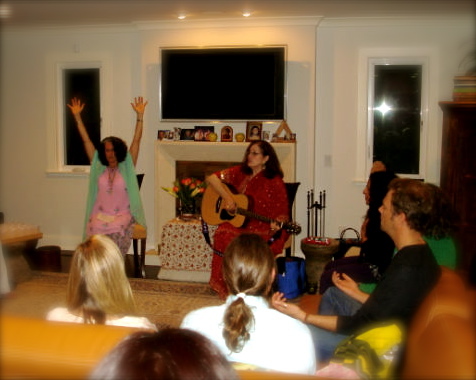 That something turned out to be an evening devoted to the blessings of the Divine Feminine. Everything both of us had brought in our hearts and in our suitcases turned out to be perfectly synched, helping to create a powerful experience for the attendees and for us as well. This entry was posted in Healing, Intuition and tagged Divine Feminine, healing, Inner Voice, Intuition.